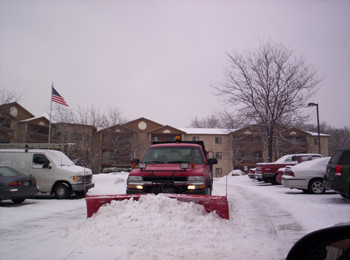 APS provides its customers with reliable and efficient snow removal and de-icing services. We will strive to exceed your needs and expectations. All snow removal vehicles are equipped with 2-way radios and phones so crews can respond quickly to any problem areas or to meet any special request that you may have. Because of our commitment to service, APS only services a limited area during the winter months. This allows us to better serve our winter customers in heavy snowfall conditions. As soon as possible after a snow event is identified we will monitor local and regional radar maps which are updated every 15 minutes. During snowfall, our voice mail is reviewed hourly. 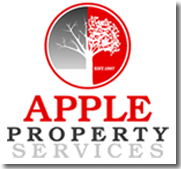 Please leave a detailed message including property name, address and specific request. The city and county snow plows will plow at different times resulting in snow buildup at driveway and property entrances. A return pass will be made within 24 hours. We often rotate the order in which properties are plowed depending upon snow fall amounts or time of day. As part of snow plowing procedures, snow may be pushed back far enough along drives and walks to make room for future snowfalls. Parked vehicles in drives or on private roads may make it difficult for plow trucks to plow driveways, roads and guest parking areas. Plow drivers will pass the area until it is safe to plow. We will make a return trip to your property later in the day or the following day to plow areas where vehicles may have moved. 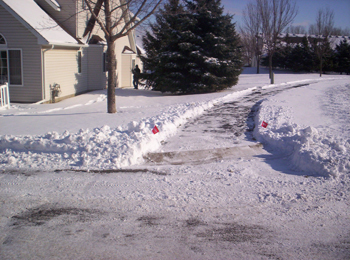 The sidewalk crews are separate from the plowing crews and arrive at your property before or after the plow crews depending upon storm type and property layout. When a snowfall has been forecasted for our area please take a minute to check your sidewalk and driveway for items such as, dog chains, newspapers and electrical cords for holiday lighting. Year round decorative lighting should be installed 12 inches from walk or further. During plowing operations please keep young children inside your home. When we arrive at your property, if children are present, they may be asked to go inside until the plowing has been completed. When approaching a plow vehicle while driving or walking, please make eye contact with operator of the plow vehicle and then proceed with caution. When home during plow operations, please move vehicles to an area that has been completed.